Of all the environmental tragedies that I can be upset about, one stands out as unique and potentially more devastating than many that are much more widely publicized. That is invasive species. We are dealing with it locally by trying to prevent the spread of zebra and quaga mussels, similar to what’s happening in the Great Lakes. In the Caribbean, Lion Fish that have been somehow released from aquariums are making their way into the ecosystem throughout the Bahamas, and as far North as the Carolinas here in the US. Measures are being taken to rid the region of these voracious predators, and even PADI has introduced a diving specialty certification course focussed on safely reducing their numbers. As information becomes more available, I’ll be sure to follow up. Hopefully to report on some successes. 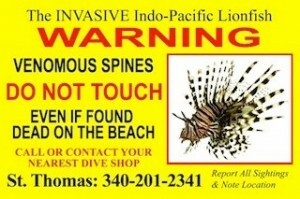 This entry was posted in Dive Travel, Diving News and tagged invasive lionfish.